close enough to keep the poet alive. words in ways that no one ever heard before. like a blind man seeing with fingertips. that intense pressure of perfection. No, not even this one. but cannot go there and still make poems. Also see The Poet by Ken Chawkin, and Mirror Lake by Rolf Erickson. A study published in the American Journal of Psychiatry’s online edition of January 15, 2010 followed 187 6- to 18-year-old girls with and without ADHD over an 11-year period. Reporting on this long-term study, Reuters Health pointed out that girls with the disorder were more likely than their peers to develop depression, anxiety, eating disorders, or other psychiatric problems by the time they reached adulthood. While in some cases a child cannot function without medication, there is growing concern about the health risks and side-effects associated with the common ADHD medications, including mood swings, insomnia, tics, slowed growth, and heart problems. “Medication for ADHD is very effective for some children, but it is marginally or not effective for others. Even for those children who show reduced symptoms with the medication, the improvement is often insufficient or accompanied by troubling side-effects,” said William Stixrud, Ph.D., a Silver Spring, Maryland, clinical neuropsychologist. “Virtually everyone finds it difficult to pay attention, organize themselves and get things done when they’re under stress,” explained Stixrud. “Stress interferes with the ability to learn—it shuts down the brain. Prior research shows ADHD children have slower brain development and a reduced ability to cope with stress.” added Stixrud. The Transcendental Meditation (TM) technique may be an effective and safe non-pharmaceutical aid for treating ADHD, according to a recent study published in the online peer-reviewed journal Current Issues in Education. The pilot study was conducted in a private K-12 school for children with language-based learning disabilities. Participation was restricted to 10 students, ages 11-14, who had pre-existing diagnoses of ADHD. About half of the students were on medication. The students meditated at school in a group for 10 minutes, morning and afternoon. After three months, researchers found over 50% reduction in stress and anxiety, and reduced ADHD symptoms in the entire group. “Everyone noticed the change,” Andy added. A soon-to-be-published second study on TM and ADHD shows that after 3 months of practice the TM group demonstrated more efficient brain functioning (as measured by EEG) compared to the control group during a difficult visual-motor task. The TM group also showed improvements in language skills on a cognitive performance test. Students reported that they felt calmer, less stressed, and better able to concentrate on their schoolwork. They also said they were happier since they started TM. · The Center for Disease Control reports that nearly 50% of the 4.5 million children (ages 4-17) in the United States diagnosed with ADHD are on ADHD medication—and the majority of those on medication stay on it in adulthood. · The rate of prescriptions for Attention Deficit Hyperactivity Disorder in the U.S. has increased by a factor of five since 1991—with production of ADHD medicines up 2,000 percent in 9 years. · The commonly used drugs for ADHD are stimulants (amphetamines). These drugs can cause persistent and negative side-effects, including sleep disturbances, reduced appetite, weight loss, suppressed growth, and mood disorders. The side-effects are frequently treated with additional medications to manage insomnia or mood swings. Almost none of the medications prescribed for insomnia or mood disturbances are approved by the Food and Drug Administration (FDA) for use with children. · The long-term health effects of ADHD medications are not fully known, but evidence suggests risks of cardiac disorders and sudden death, liver damage and psychiatric events. It has also been found that children on long-term medication have significantly higher rates of delinquency, substance use, and stunted physical growth. · The Transcendental Meditation technique is an effortless technique practiced 10-20 minutes twice a day sitting comfortably with the eyes closed. · TM is not a religion or philosophy and involves no new beliefs or change in lifestyle. · Over 350 peer-reviewed research studies on the TM technique confirm a wide range of benefits for mind, body and behavior. · Several studies have compared the effects of different meditation practices and found that Transcendental Meditation provides deeper relaxation and is more effective at reducing anxiety, depression and hypertension than other forms of meditation and relaxation. In addition, no other meditation practice shows the widespread coherence throughout all areas of the brain that is seen with Transcendental Meditation. · The Transcendental Meditation technique is taught in the United States by a non-profit, educational organization. · More information can be obtained by calling 888-LEARN-TM or visiting www.ADHD-TM.org, www.AskTheDoctors.com, or www.TMEducation.org. NB: After posting this article, a new study came out on July 26, 2011: New study shows Transcendental Meditation improves brain functioning in ADHD students: A non-drug approach to enhance students’ ability to learn. A random-assignment controlled study published today in Mind & Brain, The Journal of Psychiatry (Vol 2, No 1) found improved brain functioning and decreased symptoms of attention-deficit/hyperactivity disorder, ADHD, in students practicing the Transcendental Meditation® (TM) technique. The paper, ADHD, Brain Functioning, and Transcendental Meditation Practice, is the second published study demonstrating TM’s ability to help students with attention-related difficulties. See TM improves brain function in ADHD students, also reported in the TM Blog: New study finds TM boosts brain functioning and helps students with ADHD. And this new important related article posted in The Huffington Post on meditation helping kids get off ADHD drugs came out in Jan 6, 2012: ADHD Drug Shortage: Can Meditation Fill the Gap? Prisoners at the Dominica State Prison have received the opportunity to learn the art of transcendental meditation, as well as engage in competitive indoor and outdoor sports on the prison’s compound, according to Superintendent of Prisons Algernon Anthony Charter. In his address at the closing of the January Criminal Assizes at the High Court of Justice on Thursday Charter said the transcendental meditation program which recently started is intended to help change the behaviour of prisoners. “This will help them to relax …. We hope that it will help them to see and behave differently,” Charter noted. He assured that this program would not give prisoners the power or ability to abandon the prison grounds. “The inmates who are going to do transcendental meditation, we give the assurance that they will not leave the prison shores … we offer opportunities hoping that they change their cognition,” Charter said. “We are also going to start very soon some competitive sports between the inmates, booth indoor and outdoor,” he added. A skills training program is being conducted at the institution, where prisoners are taught construction. “We continue to do some skills work with inmates in terms of construction. We are constructing a new kitchen, bakery, mess hall and stall room facility with the help of the inmates,” Charter informed. He also gave an account of the population of the state prison, stating that 275 inmates are housed there – four females and 271 males. Sixty-nine males and one female are convicted from the High Court, while 143 males and three females were sentenced at the Magistrate’s Court. Fifty-six males are on remand, including three males standing for trial. The superintendent said that there are a small number of juveniles enrolled at the prison. They are housed separately from the adults. Charter said that most violent fights occur among juveniles. Peter Wallace: I guess it started really in Paris when I had an experience an existential experience to take charge of my own life and direct it in such a way that it would have some meaning. That involved figuring out what the meaning of life was and it involved doing something about it. Dr. Neil Paterson, Minister of Administration of the Global Country of World Peace, shares a relatively unknown chronology of how Maharishi’s private peace-creating efforts saved our world from total self-destruction. He gave this report on the Maharishi Global Family Chat. Click this title, Initiative to Create Peace in the World, and scroll down to July 09, 2016 to play it. (NaturalNews) According to the American Academy of Anti-Aging Medicine, 90% of all adult illness is due to the degenerative processes of aging. Anti-aging medicine, aiming for longevity and optimal health, is most certainly the ‘specialty’ of the future and is based on the early detection, prevention and reversal of age-related disease. While science continues to search for answers, research has already revealed that meditation is a potent anti-aging practice that can take years off your physiological age. Aging is most certainly a complex issue with many factors coming into play, but one thing that researchers do agree on is that stress (mental, emotional, and physical) causes us to age. In a recent interview with CNN, Dan Buettner, author of “The Blue Zones” and researcher into longevity hotspots around the world, suggests small lifestyle changes can add up to 10 years to most people`s lives. He says aging is 10% genetic and 90% lifestyle. Buettner stated that having mechanisms to shed stress, like prayer and meditation, was of high importance in the longevity hotspots he studied and a major factor in long-term health and aging. Dr. Robert Keith Wallace was one of the first scientists to study the effects of meditation on aging and he published his findings in the International Journal of Neuroscience (16: 53 58, 1982). His research was based on the practice of Transcendental Meditation. Dr. Wallace found that subjects with an average chronological age of 50 years, who had been practicing Transcendental Meditation for over 5 years, had a biological age 12 years younger than their chronological age. That means a 55-year-old meditator had the physiology of a 43-year-old. History reveals many examples of seemingly `ageless` saints, dedicated to the practice of meditation, whose lives have demonstrated the enormous capacity of the human body to live much longer than today`s average life span. Yes, these `ageless` saints and yogis practically dedicated their whole lives to meditation but even we, as average householders, can potentially live much longer, healthier lives. Meditation has revealed itself to be one of the most beneficial practices to relieve some of the stress related to aging. Angela’s expertise is organics, meditation & alternative healing techniques and philosophies. She holds qualifications in Natural Skin Care Product Development, Reiki, Thought Field Therapy, Organic Facials & Massage. A Bit of Sad News. Please join me in remembering a great icon of the entertainment community. The Pillsbury Doughboy died yesterday of a yeast infection and trauma complications from repeated pokes in the belly. He was 71. Doughboy was buried in a lightly greased coffin. Dozens of celebrities turned out to pay their respects, including Mrs. Butterworth, Hungry Jack, the California Raisins, Betty Crocker, the Hostess Twinkies, and Captain Crunch. The grave site was piled high with flours. Aunt Jemima delivered the eulogy and lovingly described Doughboy as a man who never knew how much he was kneaded. Doughboy rose quickly in show business, but his later life was filled with turnovers.. He was considered a very smart cookie, but wasted much of his dough on half-baked schemes. Despite being a little flaky at times, he still was a crusty old man and was considered a positive roll model for millions. In lieu of flours, just send a little dough. 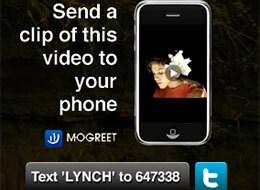 Award-winning director (and three-time Oscar nominee) David Lynch (of Blue Velvet and Twin Peaks fame) and the David Lynch Foundation Television have teamed up with mobile video marketer Mogreet to bring video MMS messages to Lynch fans. We spoke with Mogreet and the David Lynch Foundation about the technology, the purpose of the campaign and how the DLF is using social media and technology to further its message. The ever-increasing pace of smartphone adoption only underscores the growing importance of mobility. As we’ve seen with everything from mobile app stores to the Red Cross’s text message for Haiti campaign, mobile is an extremely valuable platform for brands and nonproﬁts to get their messages across. Video is an important communication driver, too, and when you combine the two technologies together, you end up with something potentially amazing. Last month, we wrote about Thwapr, a company that specializes in doing mobile-to-mobile video. We see mobile video messaging as something that’s only going to continue to grow, especially as more and more companies realize just how many users are able to actually view video on their phones. One of the companies that is really focused on mobile video marketing is Mogreet. Mogreet works with companies so that they can send video MMS messages to users that request their information. Because virtually every mobile phone sold since 2005 or so can support MMS messages that include video playback, the potential audience for these sorts of messages is huge. I spoke with James Citron, the CEO of Mogreet, and he told me that the company has more than 2,700 device proﬁles in its database, meaning that if you have a cell phone, chances are, it can play one of Mogreet’s video MMS messages. Each video is encoded in a variety of different formats and it is sent to phones in the best format for that phone, so that users of an iPhone get a different experience than someone using a Motorola Razr, but each user gets the best possible experience for his or her device. While this has primarily been used for commercial advertisers, Mogreet is interested in getting into the non-proﬁt space too, because that’s perhaps an even better market for this sort of service. Think about it, what if you could donate and then get a video message back showing someone who is helped by your donation saying thanks? Or what if you could see what is going on in Haiti or some other place that needs aid? The non-proﬁt organization’s message might be that much more powerful. After all, images often speak louder than words. To that end, Mogreet decided to work with the David Lynch Foundation and bring some of Lynch’s talents — and messages — to his fans. The David Lynch Foundation Television is dedicated to documenting programs that awaken creativity and transform lives. To that end, the foundation has a website, DLF.TV, that has lots of video content of David Lynch and of people the Foundation has helped, as well as of other artists and friends who have support the Foundation’s vision. The ﬁrst mobile video message that the DLF will be sending to fans is of a short ﬁlm that Lynch directed featuring the musician and artist Ariana Delawari. Delawari’s debut album, Lion of Panjshir was recorded in Kabul and Los Angeles, and reﬂects the cultures of both places. Delawari’s decision to return to Afghanistan in 2007 to record the album inﬂuenced her work and its overall sound. Like Lynch, Delawari is a student of transcendental mediation and like Lynch, it has also inﬂuenced her life and her work. Lynch directed a six-minute short showing off Delawari’s style and voice. The style is unmistakable Lynch, from the background to the sound mix to the camera angles. It’s also a piece that works well when viewing on the web or on a mobile phone. 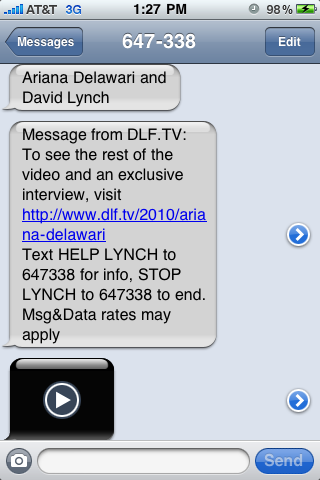 To spread the word about Delawari — and to kick off a mobile-type of initiative — fans can text ‘LYNCH’ to 647338. It’s an interesting approach to spread a message from an always-interesting director. It’s also something we expect to be a growing trend, especially as nonproﬁts start to embrace the power of mobile. What do you think about mobile video? Are you a fan of David Lynch? What do you think of this initiative? Let us know! The Daily Gate City received six awards in this year’s Iowa Newspaper Association’s Better Newspaper Contests. Nearly 4,000 entries in dozens of categories were judged by class, based on circulation. The Daily Gate City competed in Daily Class 1, which includes dailies with circulations of 9,999 and less. The newspaper and staff writer Cindy Iutzi placed first in the best spot news story category with a story about a group of teenagers who floated down the Des Moines River and were stranded on an island overnight. The Daily Gate City and Iutzi and staff writer Diane Vance finished second in the best news story category with a story about sexting, a practice in which sexually-suggestive and explicit photos are sent over cell phones. The newspaper finished third with its coverage of education during the contest period. Most of the articles were written by Vance, who has left the paper and is pursuing a master’s degree at Maharishi University in Fairfield now. The Daily Gate City and Iutzi received a third-place award in the best news photo category with a photo of the Parkersburg tornado taken at a storm spotters’ seminar in Keokuk. Amanda Grotts of the DGC’s composing department placed third in the best ad designer category with a group of different ads. In addition, the newspaper was judged third in the best newspaper Web site category. The awards were presented Friday during the INA 2010 Convention and Trade Show in Des Moines. The Des Moines Register was named the INA’s Newspaper of the Year for 2010. The Muscatine Journal placed first in general excellence among the Class 1 dailies. Diane Vance graduated from Maharishi University of Management with a graduate degree in education, left to teach at a school, then returned to Fairfield to write, very well, for the Fairfield Ledger. Here is a personal article about her journey to Finding peace in Fairfield.